This RF 433MHz wireless switch is a low-cost, affordable device that allows users to remote turn on/off connected appliance of different types and brands via app EWeLink from anywhere anytime in the world, and by setting timing schedules for your appliances, you can maintain a carefree life. It supports inching /self-locking mode. *APP Remote Control: Supports WiFi network. Supports numerous WiFi smart switches on one smart phone. 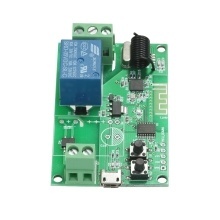 *Supports remotely turn on or off connected appliances, for example light, electric kettle, rice cooker, electric curtain, garage door, access control, remote turn on PC, water pump,etc. *Supports control by 433MHz RF Remote. After successfully learning codes with 433MHz RF Remote, the WIFI switch can be turned on/off by remote control indoors. *Voice Control: Compatible perfectly with "Amazon" Alexa, for Google Home/Nest, IFTTT. *The delay time of inching can be adjusted in the APP(0.5s~3600s).